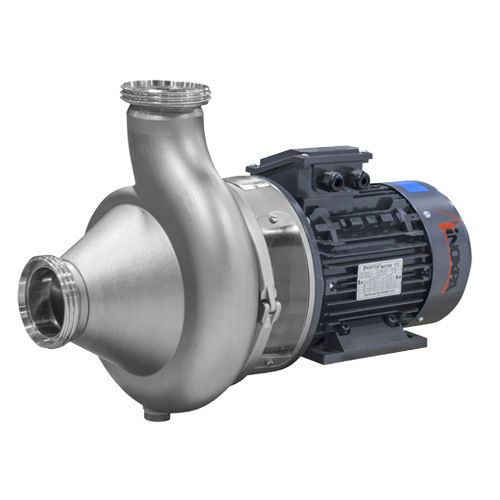 The RVN centrifugal pump with helicoidal impeller is the best solution for the transfer of liquids with solid particles or medium viscosity products that cannot be pumped with an ordinary centrifugal pump. Due to the helicoidal shape of the impeller, the transfer of the product is gentle and without clogging., e.g. solid particles suspended in water (proportion 40% to 60%). 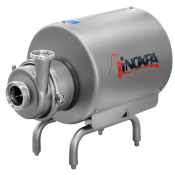 The pump is ideal for applications of the transfer of pieces of fruit or whole fruits, olives, mushrooms, slices of orange, vegetables, fish, etc. 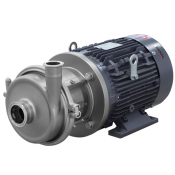 RVN centrifugal pumps with helicoidal impeller are widely used in wineries for the pump-over process where the high capacity and minimum destruction of the solid parts (seeds, skins, etc.) is required. The design of the pump contributes to a better extraction of tannin, the coloring matter of wine, in the phase of vinification, reducing the lees formation and, as the result, achieving high quality wines. 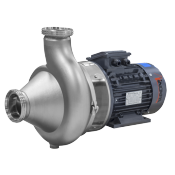 Due to the helicoidal shape of the impeller and to the flow optimised to avoid the obstruction of the pump, solid particles pass through the pump without being damaged. 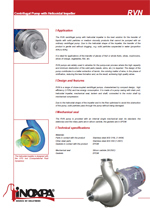 RVN is a range of close-coupled centrifugal pumps, characterised by compact design, high efficiency (>70%) and low energy consumption. It is made of a pump casing with drain port, helicoidal impeller, mechanical seal, lantern and shaft, connected to the motor shaft by mechanical compression. 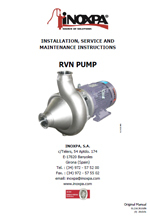 The RVN centrifugal pump pump is provided with an internal single mechanical seal. As standard, the stationary and the rotary parts are in silicon carbide, the gaskets are in EPDM. Summary Les pompes à roue hélicoïdale RVN sont compactes, à aspiration axiale et à refoulement radial et les branchements sont de type sanitaire.